DeSoto Independent School District is asking the community to submit names for their new elementary school set to open in the fall of 2018. The school will be southeast of the Polk/UhlRoad and Parkerville Road intersection, with the entrance from Parkerville Road. The guidelines for submitting names are fairly generic, Executive Communications Director for DeSoto ISD Beth Trimble said. There are five categories for possible school names. First is a person or persons who served the district or community, especially services to children. Other possibilities would be for a state or national heroic figure, or person(s) who made a significant contribution to society and/or education, whose name would lend “prestige and status to an institute of learning.” A local residential or geographic area might also be a candidate. 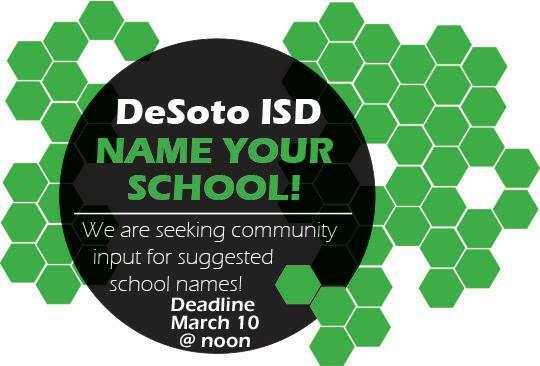 To submit your suggestion, visit www.desotoisd.org/naming, or visit the Facebook page for DeSoto ISD. If you have a name to submit, attach a bio or link to their information and tell why you believe the school should be named for your candidate. Ms. Trimble said a group of people from the community who agree on a candidate can submit a joint application. Deadline for submissions is Friday, March 10 at 12 noon. The final name will be selected by the DeSoto ISD board of trustees. President of the Board is Carl Sherman, Jr. The seven members of the board will hold a workshop starting at 5:30 p.m. March 20 to discuss the submissions and decide on a name. The workshop will be held in the board room, and is open to the public. Ms. Trimble said while most of the schools in DeSoto ISD were named for their streets or locations, three schools have been named to honor a deserving individual. Two elementary schools, the Ruby Young Elementary School and the Frank Moates Elementary School, were named for longtime educators. Ms. Young, who has since died, taught school for many years in the district. Mr. Moates, who still attends district functions with his wife when he’s available, served the district as Superintendent for years. In August, 2007, a new middle school was named for Curtistene McCowan, a former Senior Investigator at the Federal Trade Commission. 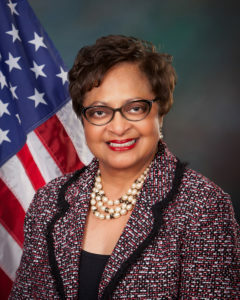 As the first African-American elected to public office in DeSoto, starting in 1990 she served two three-year terms on the DeSoto ISD Board of Trustees, also serving as President. In 2000 she was elected the Charter President of the DeSoto ISD Education Foundation Board of Directors. Now serving as the Mayor of DeSoto, Ms. McCowan is an active participant in DeSoto ISD’s One on One Mentoring Program. She has held numerous other regional leadership positions. Now is your chance to give that great feeling to another special person or persons who, in your opinion, is worthy of such an honor. If chosen, they will be in good company.